Take the fun French fact quiz! Québec facts are interesting to study, predominantly because Québec is almost unto itself as far as Canadian Pronvinces go. That's almost but not quite. Québec has somehow managed to combine both its own unique Québécois culture and Canadian culture and live alongside, albeit not always happily, its other provincial neighbors. Québec (pronounced correctly as kay bek) is the largest province in Canada (in terms of area), laying on the Eastern section of the country and stretching as far North as the Ungava Bay and as far south as New York State. It is unique in Canada, largely for being a predominantly French speaking province. While Canada as a country remains bilingual, the official language of Québec is French, and here you will generally hear only French spoken. The province is the second most populated province of Canada, however, most people live in the more urban areas between Montréal and Québec City--along the St. Lawrence River. After all, there are not many people who would willingly withstand the freezing cold temperatures near the Arctic. Québec was originally considered part of New France, and was originally inhabited by the Algoquin, Iroquois, and Inuit indians. In fact, the word Québec is from an Algoquin word which means "it narrows." This refers to the narrowing of the St. Lawrence river near Québec City. Population wise, Québec is the second largest province, trailing after Ontario. While the capital remains in Québec City, the largest city in terms of population is the further southern lying Montréal. There are many interesting and fascinating aspects of French culture and history that stem from Québec. Did you know any of this trivia? 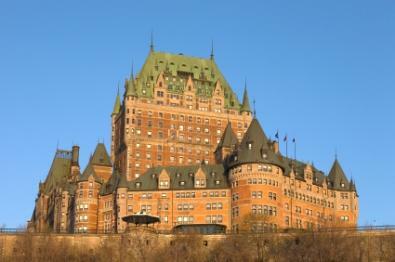 The Château Frontenac, is the most photographed hotel in the world. Lines that divide a road between coming and going traffic were first seen near the Québec border in 1930. In 1995, Québec almost separated from the Canadian union in a vote that was 49.5% in favor of separating, 50.5% against separating. Québec is referred to as La Belle Province and is divided into 21 different tourist regions. The motto of Québec, scripted on the license plates, is Je me souviens. . . which means "I remember." Ironically, the meaning of what Québec is remembering has been debated and analyzed for decades. Québec boasts one of the largest windmill energy parks in the world. Céline Dion--This French songstress was born in Charlemagne, Québec. She is most noted for her amazing power ballads, and in particular, the theme song from the movie The Titanic. William Shatner--The beloved Captain Kirk from Star Trek hails from Montréal, Québec. Mario Lemieux--Retired hockey player Lemieux is arguably one of the best hockey players to skate on the ice. Glen Ford--A popular actor in the 50's and 60's, Glen Ford's last appearance was in the movie Superman, as Clark Kent's adoptive father. These are just a few among the many architects, actors, musicians, painters, and politicians that are well known from Québec. Winter carnavale in Québec is a world renowned celebration that attracts thousands of visitors every year. Some have compared it to Mardi Gras--a time for celebrating, and grand merriment. Typically held during the first two weeks of February, it comes in the dead of winter and is a welcome break from the mundane. Québec makes a very charming destination for traveling. Not only are there a variety of things to do season round, it is unique in Canada because of its distinctive blend of Inuit, American Indian and French cultures. Although the French that is spoken does sound different than its European counterpart, you would still do well to gain fluency and practice in Québec!